This is the NON-MOVING version of our Mother prop from the Frightronics line. Perfectly preserved this poor old Mother prop is a foam-filled with latex skin. 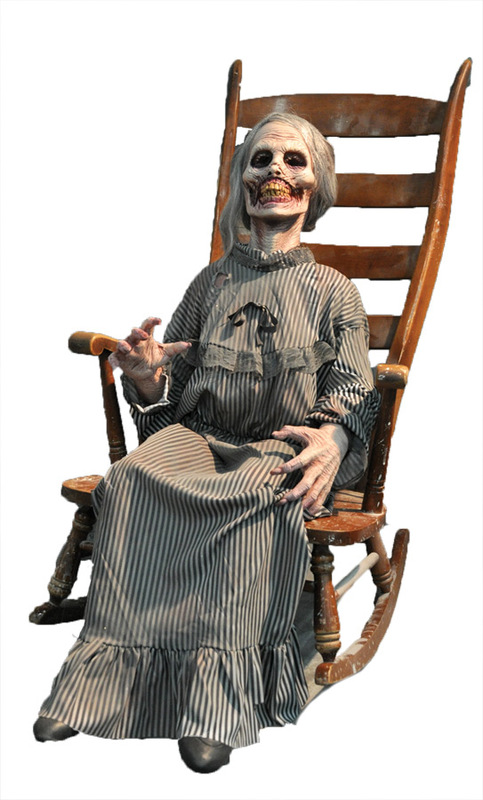 Place her in a rocker, on your sofa, on a porch swing... this gruesome old gal will make everyone take a double take! Life size. The Good: Nice Heavy solid prop, Great sculpt, Okay Paint job, looks almost like the photo. The Bad: the Legs on mine where cut too deep and there hanging on by a thread, easy fix with a wood rod and some hot glue, I shouldn't have to do this quality control should be better, slow down Distortions! I contacted Distortions with no reply. Wish the paint was a little darker and more gloss was added. Be care full buying online the product never looks like the stock photo.